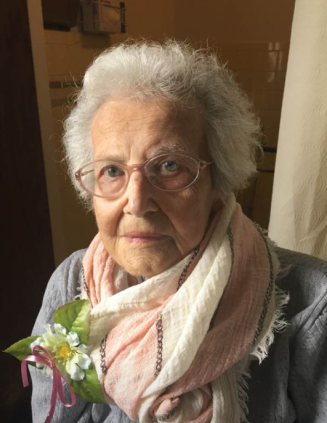 Irene Courchesne Dydek, 93, a lifelong resident of Holyoke, MA, died on October 17, 2018. Irene was born in Holyoke on April 9, 1925 to the late Pierre and Angeline (Allie) Courchesne. Irene took loving care of a large, extended family and worked as a hostess at The Roger Smith, as a teller at Peoples Bank, and a sales associate at Paysaver. Irene enjoyed singing, playing cards, watching birds, collecting shells, and family gatherings. Beloved wife of Karol F. Dydek (pre-deceased) for 66 years, Irene leaves behind sons Charles Dydek (Deborah), Kyle Dydek (pre-deceased); daughters Barbara Simpson (Geoffrey) and Mary Sexton (Eric); grandchildren Dennis Scribner (Kimmy), Amy Sullivan (Tim), Danyelle Lango (Michael), David Hyndman, Dominique Hyndman, Eric Sexton, Griffin Simpson, and great-children Max & Myles Scribner, Ava Sullivan, and Joshua Lango. The funeral will be held Monday, October 22nd at 9:00 a.m. from the Barry J. Farrell Funeral Home, 2049 Northampton Street, followed by a Mass in Blessed Sacrament Church, 1945 Northampton Street at 10:00 a.m. Burial will follow at Mater Dolorosa Cemetery, South Hadley. Calling hours will be held Sunday October 21st from 2:00 to 5:00 p.m. Contributions in lieu of flowers may be made to Mass Audubon Arcadia Wildlife Sanctuary in Easthampton, MA.